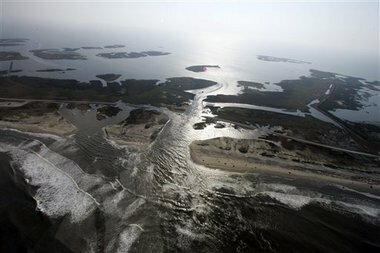 Rapid sea level rise blamed on global warming threatens to put East Coast underwater | "Global Possibilities"
Associated PressA flooded road on Hatteras Island, N.C., after Hurricane Irene swept through the area, cutting the roadway in five locations. From Cape Hatteras, N.C., to just north of Boston, sea levels are rising much faster than they are around the globe, putting one of the world’s most costly coasts in danger of flooding, according to a new study published June 24 in the journal Nature Climate Change. WASHINGTON (AP) — From Cape Hatteras, N.C., to just north of Boston, sea levels are rising much faster than they are around the globe, putting one of the world’s most expensive coasts in danger of flooding, government researchers report. U.S. Geological Survey scientists call the 600-mile swath a “hot spot” for climbing sea levels caused by global warming. Along the region, the Atlantic Ocean is rising at an annual rate three to four times faster than the global average since 1990, according to the study published Sunday in the journal Nature Climate Change. Computer models long have projected higher levels along parts of the East Coast because of changes in ocean currents from global warming, but this is the first study to show that’s already happened. “Where that kind of thing becomes important is during a storm,” Sallenger said. That’s when it can damage buildings and erode coastlines. Jeff Williams, a retired USGS expert who wasn’t part of the study, and Stefan Rahmstorf, a professor of ocean physics at the Potsdam Institute in Germany, said the study does a good job of making the case for sea level rise acceleration. Those estimates became an issue in North Carolina recently when the Legislature proposed using historic figures to calculate future sea levels, rejecting higher rates from a state panel of experts. The USGS study suggests an even higher level than the panel’s estimate for 2100. The North Carolina proposal used data from University of Florida professor Robert Dean, who had found no regional differences in sea level rise. Dean said he can’t argue with the results from Sallenger’s study showing accelerating sea level rise in the region, but he said it’s more likely to be from natural cycles. Sallenger said there is no evidence to support that claim. SETH BORENSTEIN, AP Science Writer. Associated Press writers Allen Reed in Raleigh, N.C., and Jeff Barnard in Grants Pass, Ore., contributed to this report.